Mrs. Quicke's daughter, Jane, loves her cheese. For the past few weeks, a celebrity spawn of sorts (at least, as far as the cheese world is concerned) has been working behind the counter at Murray's. 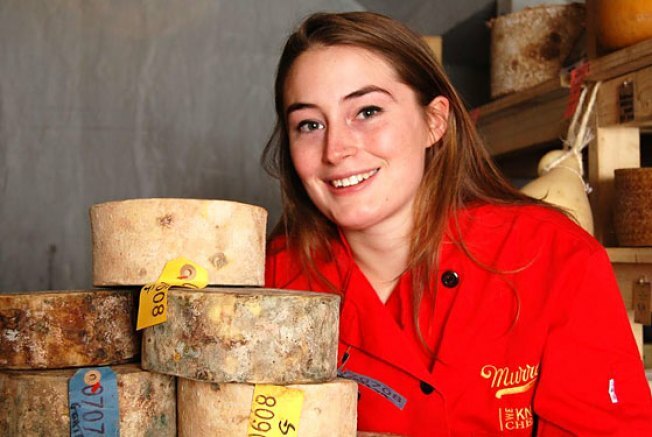 The 19-year-old daughter of English Cheddar-maker Mrs. Quicke, Jane, was hired as an intern there three weeks ago. Though she was raised on the family farm in Devon and she suspects her mother would like her to go into the business (though she has never said as much), Jane really didn't know much about anything besides Cheddar until she came to the States to participate in what she calls "cheese tourism." We asked her how it has gone so far. What's the biggest difference between American and English cheeses? Before I interned at Murray's I traveled around the United States doing presentations about Quicke's -- I went to Ohio and was shocked that some people wanted to know why our cheese wasn't orange, because isn't that the natural color of Cheddar? In many places Cheddar was just a euphemism for hard cheese. I thought, maybe Americans don't know about cheese! Speaking of orange cheese, have you tried stuff like Kraft singles and Cheez Whiz? I tried it but I didn't really like it, and it's not really cheese as I know it. But they serve their purpose in a cheeseburger or something. What American cheese is most similar to yours? Probably the Grafton Village clothbound, or maybe the Fiscalini. A huge divider of Cheddar is whether it has been aged at low temp in Cryovac or whether it has been aged at a slightly higher temp in a cloth. I prefer the original clothbound because it allows for a more complex flavor. When you put cheese in Cryovac, the bacteria and enzymes that contribute to the flavor are narrowed. Is there a difference in the milk they use? Grafton Village uses Jersey milk and we use a mixture of Swedish red and Ayrshire, as well as a smaller amount of Jersey milk. They have a higher fat concentration whereas ours have more protein. Do you ever worry about cheese fatigue? Losing your taste for the stuff? It never occurred to me that that might happen, since there's so many different cheeses. You can have a Gjetost, a Norwegian cheese which is almost like fudge (you make it by heating whey as opposed to the curd), and then a really fresh cheese, and a blue cheese. Is there one cheese you&rsquo;ve really fallen in love with at Murray&rsquo;s? We have a relatively fresh goat cheese with a geotrichum mold and ash on the rind. It&rsquo;s creamy and peppery and interesting. So what are your plans after this? Are you going to create your own cheeses? I'm going to go to Imperial College in London to specialize in microbiology -- originally my ambition was to find and develop traditional starter cultures that have been lost. What would be so cool is to make a wash-drain cheese, but I think I'd annoy my roommates if I started making that in the communal kitchen. That's when you brine the rind every so often during the aging process. There's a story about some monks who were making cheese and they didn't like the fact that the mold grew on the outside. They washed it with salt and the cheese became sticky and smelly. If you smelled the cheese, you wouldn't think of putting it in your mouth -- but then you taste it and the taste is so different from what you smell. Finally, what were your first impressions of New York, coming from the countryside? And have you gotten to visit cheese destinations like Artisanal? I visited Artisanal in June with my mother and met Max and we did a cheese tasting that was really interesting. The first few weeks I was here, I was so scared. In my tiny little village, if you see someone on the street you always stop and say hello because chances are, even if you don&rsquo;t know them, you're going to see them the next day. Another thing is, in England, when you're 16 (maybe it's even 14) you can drink alcohol in a bar. Here you have to be 21, which is very peculiar!